Immerse yourself in Cartagena’s millennia of history—and enjoy an introduction to the city’s gastronomic offerings, too—on this small-group walking tour. Begin your explorations from the port and head to the Parque Torres, which offers panoramic views overlooking the city. Then, continue to the Roman Theatre of Cartagena—one of the city’s highlight ancient attractions—see the Roman Forum District, and more. 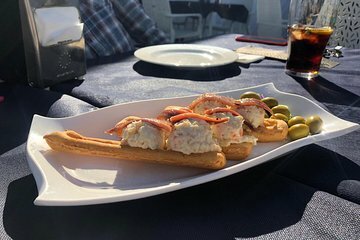 Then, enjoy a restorative snack when you sample some of the city’s tapas dishes. Monday to Sunday, 10:30 and 17:00 local time. Unable to hear "guide" via her so-called microphone. Was NOT a small group tour as advertised....closer to 20 people. Guide aslo "barked" instructions and was clearly overwhelmed with such a large group. After a considerable walk with no information, and no tapas, we left to go off on our own...and then finally saw the colosseum and found the main malacon and shopping district. Had tapas, Sangria and Cereveza on our own and found our way back to cruise ship.